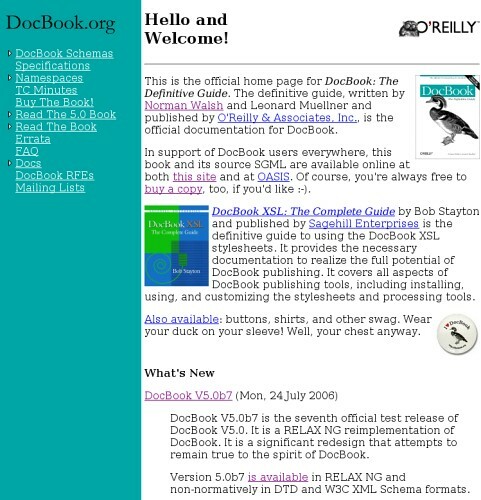 Yesterday, I rolled out a redesign of the DocBook.org website. 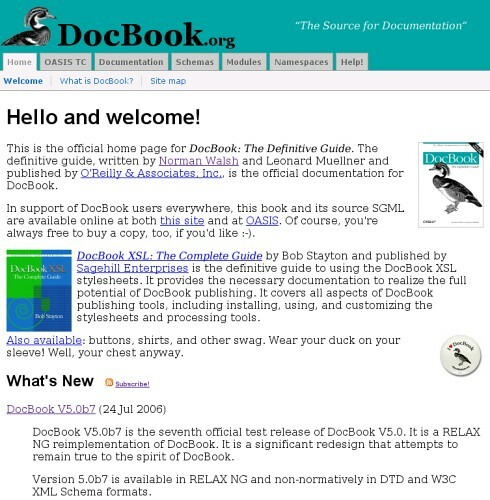 DocBook.org, like nwalsh.com and a number of other sites I put together, was originally created with the Website customization layer of DocBook. Back in 1999 or 2000, when I did most of the design for the Website document type, it seemed a pretty reasonable solution. Back then, CSS support was limited at best and browsers weren't as compatible as they are today, especially in the area of scripting support. In order to get a menu system, I resorted to HTML tables constructed staticly in each page And because tables aren't the most accessible sort of markup, I could also generate a completely different set of pages with more accessible markup (though I wasn't actually using that feature on docbook.org). For the DocBook.org site, this was particularly tedious because each new release of any DocBook resource added a page to the site and that required rebuilding the whole site. Also, the actual page for each release was a pretty thin skin over a simple directory listing. So, inspired by the Yahoo! UI Library, I went looking for something better. What I ended up with was a simple set of navigation tabs that require nothing more than CSS. To ease the tedium of making a new release, I decided to turn all the release pages into actual directory listings, dressed up with a little header markup and some additional descriptions. I'm still using a separate file to establish the menus, so that they can be changed without editing every page. In fact, the resulting menus are inserted into each page with a server-side include so I can actually change the menus without editing any pages. The markup for the pages, by the way, is no longer Website, they're straight DocBook V5.0 articles. I think the design is an improvement. What do you think? Speaking of website design, this site got a bit of a facelift a few weeks ago. I think it's improved as well. And I have every intention of improving the design of nwalsh.com real soon now. I haven't decided if I want to simply give the site a face lift or if I want to convert the whole thing to use my blog software. Stay tuned. There's an processing instruction with the name "xml" in the middle of the DocBook.org pages. It's a good thing you use "text/html" or else Firefox would have given DocBook.org readers an "XML Parsing Error: xml declaration not at start of external entity". Very nice. Theres a couple of broken links though: on the "Documentation" page, the links in the body to TDG and TDG5 are both incorrect and generate 404s - the correct links are in the menu above. However, both the pages linked to themselves contain broken links to the online version of TDG. Just seconding Brian, I was troubled this morning when most of the links to elements from my bookmarked DocBook reference (which I find invaluable), http://www.docbook.org/tdg/en/html/docbook.html, (for example: http://www.docbook.org/tdg/en/html/chapter.html) were broken, giving 404s. On a positive note, the main page looks much nicer. Oh, ack!, Sjoerd. I forgot that Apache was going to stick something in front of my header. I've fixed that now, and also tinkered to make the files well formed. I don't see how to make them valid unless someone knows how to make Apache use lowercase element names. Brian & Keith, I fixed the redirects. Those links should all work again. My goodness, what have you done to that poor duck's feet? Hmm. The first two links I mentioned are still broken. (ie in the body of http://www.docbook.org/docs/ , the links to http://www.docbook.org/docs/tdg and http://www.docbook.org/docs/tdg5). I see they're both relative, I think they're missing leading slashes. Thank you, Brian. Sorry I missed those. Fixed now. The link http://www.docbook.org/tdg5/tdg5-0.0.17.zip in http://www.docbook.org/tdg5/ is broken.